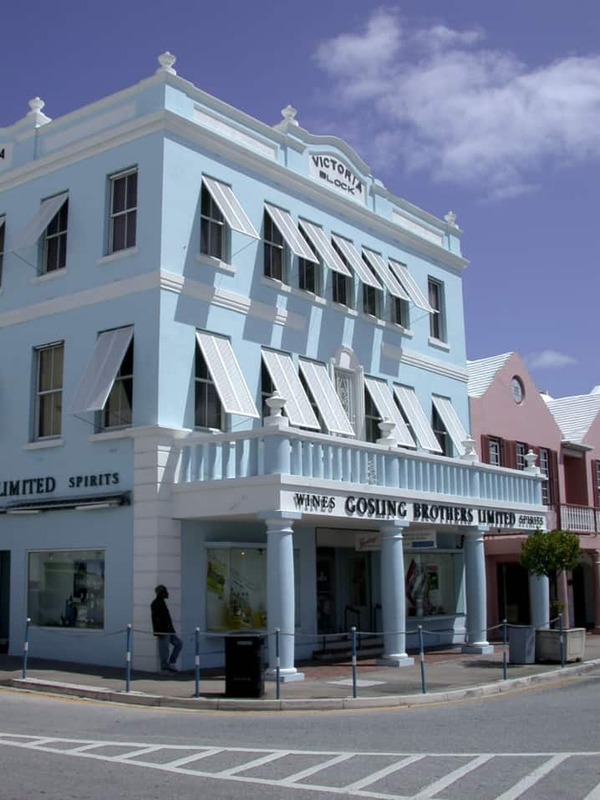 Gosling’s is one of Bermuda’s oldest and most famous companies. For the best part of two centuries they have been produced one of the world’s finest rums and have had a major impact on the island’s cultural heritage. The story of their rise to success began just over 200 years ago in England and, like many great undertakings, owed much to chance. At the start of the 19th century, William Gosling was a successful wine and sprit merchant based in London. He wanted to expand his business overseas by setting up a store in Virginia so he chartered a ship and filled it with a cargo of wines and spirits. In the summer of 1806 the Mercury set sail for the US with his eldest son William on board. After over 90 days at sea, light winds meant the Mercury had failed to reach its final destination. As the charter period had expired the captain headed for Bermuda, the nearest British port, and unceremoniously dumped William and his cargo in St George. William took a look around the island and noted that there was nobody in the wines and spirits business. On seeing the thirsty sailors of the British Royal Navy, he saw an untapped market waiting to be exploited. At the end of the year he opened a store in St George and stocked it with the cargo from the Mercury. The business was a success and prompted Williams’s brother, Ambrose Gosling, to head to Bermuda. In 1824 Ambrose opened a store on Front Street in Hamilton that still stands today. However, it was not until 1863 that they created the product that was to radically transform their fortune. Rum was an extremely popular drink at the time. In fact, from 1655 all sailors of the Royal Navy were given a daily rum ration (the practice was only abolished in 1970). At the time the rum came from distillers in the Caribbean. The Gosling family spotted another opportunity and seized upon it. Large quantities of sugarcane are needed to produce rum and Bermuda didn’t have the necessary land. Instead, they decided to import distillates from all over the West Indies and blend and age it themselves. After much experimentation with different blends, they created smooth, black rum that was named ‘Old Rum’, comprising distillates from Trinidad, Jamaica, and Barbados. At there was no bottling plant on the island, it was initially sold on draught only. Customers would take their own containers to the store and would fill them straight from the barrel. In the years after the First World War, tourists began to flock to the island. To serve the new market Gosling’s needed to bottle their rum. The solution was to use empty champagne bottles, collected from the British officer’s mess, and seal them with black wax. With no labelling customers began to refer to it as ‘Black Seal’ rather than ‘Old Rum’. The name and logo were officially changed in 1950. Gosling’s today is still wholly owned by the family and is currently managed by the 7th generation. The rum is still blended and bottled on the island and the recipe remains a closely guarded secret, known only to company president Malcolm Gosling and the master blender. The store on Front Street in Hamilton is still operation and is their main outlet in Bermuda. In 2007 they opened an additional outlet in the city. It specialises in wines and is situated at their old beer warehouse on Dundonald Street. Gosling’s also operate the Bermuda Duty Free stores in the arrivals and departure areas of LF Wade International Airport. Unfortunately, the relocation of the major cruise ship berths from St George to Dockyard, led to the closure of their branch in St George in 2008. Their store in Somerset closed in 2011. Until the last day of trading customers could still walk into the Somerset branch and fill their own bottles with rum straight from the barrel. Visitors should note that any alcohol purchased and taken out of a store in Bermuda cannot be sold at duty free prices. Cruise ship passengers can purchase alcohol at duty free prices from the store in Hamilton but it needs to be delivered to the cruise ship. Gosling’s provides this service free of charge. Airline passengers can buy duty free alcohol on departure (and arrival) at the airport. Gosling’s – A legacy of stubbornness for seven generations. In 1806 the Gosling family left London for America. Last month they arrived. Gosling’s Gold Bermuda Rum – New, luscious and widely unavailable. Almost as hard to find as Whitey Bulger. Gosling’s rums are now available in the US, Canada, UK, Australia, New Zealand, China and many other countries. A full list of distributors around the world can be found on the official website. If you can’t find a stockist near you, leave a message on their Facebook page and they’ll do their best to help. Black Seal Rum – The original blend. Gold Bermuda Rum – A rich, golden rum with a smooth taste. Family Reserve Old Rum – The same blend as the original but aged for longer. Each bottle is labelled by hand and individually numbered. It’s a sipping rum best enjoyed with a cigar or chocolate. Rum Swizzle – Pre-mixed cocktail. Dark ‘n Stormy – Ready-made version of the legendary cocktail. Enjoy straight from the can. Stormy Ginger Beer – Canned ginger beer, essential if you want to mix an authentic Dark ‘n Stormy. Black Seal Rum is the main ingredient in Bermuda’s national drink; the Dark ‘n Stormy. It’s simple to make. Just get a tall glass filled with ice, add 4-5 ounces of ginger beer, top with 1½ ounces of rum, and garnish with a lime (optional). It’s so named because the dark rum floating above the lighter coloured ginger beer resembles a storm in a glass. It was probably invented up at Royal Naval Dockyard in the early 20th century. At the time Royal Navy personnel based here produced ginger beer to raise funds for their events. At some point in time one of these sailors mixed the ginger beer with their daily rum ration and invented the cocktail. Another popular cocktail made with Gosling’s products in Bermuda Rum Swizzle. Like the Dark ‘n Stormy it’s served throughout the island, but the most famous place to sample it is undoubtedly the Swizzle Inn. Gosling’s Black Seal Rum, along with Outerbridge’s Original Sherry Peppers, is traditionally added to Bermuda Fish Chowder to enhance its flavour. The chowder is served at most restaurants in Bermuda but some of the best renditions can be found at the Lobster Pot, Wahoo’s, the Barracuda Grill, and the Somerset Country Squire. The rum is also a key ingredient in Bermuda Rum Cake, available in stores island-wide and at the Bermuda Rum Cake Company at Dockyard. If you are on the island and want to learn more about Gosling’s and sample some of its products you can take one of the Gosling’s rum cruises. The boat sails around the Great Sound while one of family members hands out samples and gives a talk covering the history of the company, how to make cocktails etc. Cruises depart from Dockyard and the Fairmont Hamilton Princess and can be booked through the Island Tour Centre (Fantasea). Map showing location of Gosling’s. Family-friendly pub with live entertainment throughout the summer. Home of the famous Rum Swizzle. What’s the recipe for a Bermuda Rum Swizzle? Michael Gosling (of Gosling’s) and Jay Correira (of the Swizzle Inn) demonstrate how to make a Bermuda Rum Swizzle.